Solen 8.00uF 400V DC FastCap Polypropylene Audio Capacitor from Falcon Acoustics, the leading supplier of diy hifi components. 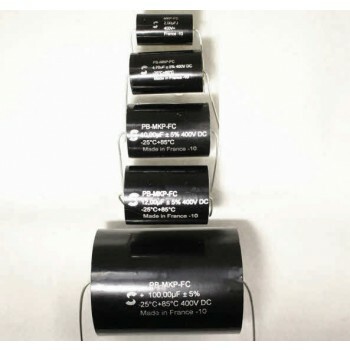 Solen 8.00uF 400V DC FastCap Polypropylene Audio Capacitor non-polarised reversible series for high quality loudspeaker crossovers and networks, tolerances available, from Falcon Acoustics, the leading supplier of diy hifi components. This value has been specially made by Solen/SCR for Falcon Acoustics and is unobtainable elsewhere. Solen 400V and 630V SCR FastCap Polypropylene Capacitors are widely used by OEM HiFi manufacturers and audiophiles. They are famous world-wide for superb sonic performance, and offer excellent value for money. As specified by HiFi World in their Kits. This value has been specially made by Solen/SCR for Falcon Acoustics and is unobtainable elsewhere.